The project began in 1996 when Amnon began searching for any violins that were played in the Holocaust. This is when he began his work, restoring these instrument to serve as reminders, but also as a way to deal with, as he states, "all [of] this heritage, which is unbelievable." Today, Amnon has dedicated 20 years to the restoration of Holocaust instruments and has restored over 60 violins. After restoration, the violins have been played in concert, displayed in museums, and brought across the world, telling the stories of their past. The instruments have been aptly named the "Violins of Hope". Historically violins have held a very important place within Jewish culture. Violins played in Jewish Klezmer music make sounds imitating the singing of prayer, weeping, and laughing. Violins were used to express many emotions and tell all kinds of stories. They were key to celebrations and many Jews learned how to play from a young age. The instruments were also frequently displayed as art, and the violins Amnon restores are often decorated with mother-of-pearl Star of Davids. But during the Holocaust, the significance of music was used against Jews. Many concentration camps had orchestras, used to lull inmates into a sense of security and normalcy. Jews who were musicians would be forced into these orchestras. They played while prisoners arrived, were marching to work, or even as prisoners were led to the gas chambers. Suicides among camp musicians were higher than average, as they were forced to watch their friends and family die around them. Unsurprisingly, many who survived abandoned their instruments, too full of memories, after the war. Today, many of the survivor's descendants are seeking to bring their stories to light once again. With the help of Amnon, who was also born to Holocaust survivors (his parents escaped to Tel Aviv fairly early- the late 1930s), they are telling the stories of the past through violins. One story in the many stories of the Violins of Hope was told to Amnon by the owner's daughter. She said during the war, her father fled to Amsterdam thinking he would be safe there. When Nazi occupation began and he realized he would be captured, her father sent the violin to a close friend. The friend took the violin and buried it, along with several photos of her father. He was later captured, and the violin remained buried for years, eventually being brought to Amnon. To hear this violin being played for the first time since its restoration, you can watch a documentary about the Violins of Hope by PBS. A trailer from a movie about the violins of Hope, "Amnon's Journey"
The Violins of Hope have traveled across the world to be displayed and performed on. Parts of the collection have traveled to Turkey, Spain, Switzerland, Monaco, and Italy. In 2012, the violins first came to the US, and since then they have traveled to North Carolina, Texas, Ohio, Florida, Alabama, Arizona, and Tennessee. There have even been exhibitions and performances in the Library of Congress. Amnon feels quite strongly that the instruments must be played again. I absolutely agree! The violins are not museum pieces, not pieces of furniture, but were made to be played. With Amnon and Avshi's careful restorations, these instruments sing again in a testament to the failed efforts of the Nazis to silence our voices, our people, and our culture. I (Andy) traveled to Phoenix recently to meet with Amnon and his family and to experience the latest incarnations of 'Violins of Hope'. It was deeply meaningful to be able to hold some of the instruments and to hear them played by the wonderful musicians of the Arizona Musicfest Orchestra with soloist Gil Shaham. Several of the musicians in the Musicfest Orchestra had ties to the Holocaust through their families, their teachers, or both. You can read the stories of each Violins of Hope. vision. And my uncle, 2nd Lt. Fred Gordon (z"l) was lost returning from a bombing flight over Nazi Germany. The man threw his violin out the narrow window. It landed on the rails and was picked up by one of the French workers. For many years the violin had no life. No one played it. No one had any use for it. Years later the worker passed away and his children found the abandoned violin in the attic. They soon looked to sell it to a local maker in the South of France and told him the story they heard from their father. The French violin maker heard about Violins of Hope and gave it to the Weinsteins, so the violin will live on. " 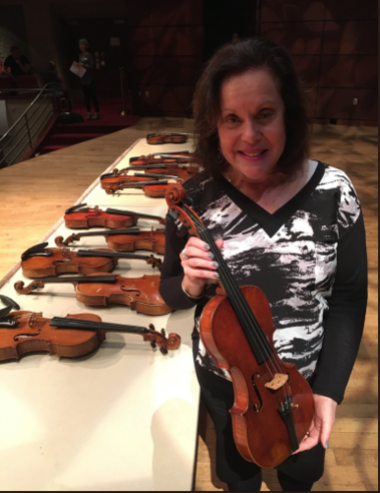 Fellow Minnesotan Janet Horvath (former Minnesota Orchestra Associate Principal cellist, author, teacher, performer, and public speaker) traveled to Arizona as well. Janet's parents were Holocaust survivors. Janet's father, George Horvath, was a professional orchestra cellist before World War II, was captured by the Nazis, and spent several years as a slave laborer. Having lost everything to the Holocaust, George managed to procure a cello shortly after being freed and formed the St.Ottilien Orchestra. This orchestra performed 200 morale-boosting concerts in 100 Displaced Persons Camps around Bavaria, including two concerts conducted by Leonard Bernstein at the Landsberg Displaced Persons camp. Janet performed with a chamber music group at Phoenix Violins of Hope, including one piece on a cello from the collection. It was very meaningful for me to rendezvous with Janet there and personally introduce her to Amnon. Janet's parents' story, in far more detail, is set in manuscript form and is awaiting publication. Watch for it! Janet spoke of her parents' experience during the chamber music performance in Phoenix. Janet related this story to me, "At intermission, a lady came backstage weeping. She had to tell me that her parents, who were in the Landsberg DP camp after surviving the war, heard the Bernstein concert and always spoke about it. And... she was born there in the camp!" Amnon with Janet Horvath, who was mentioned in our previous blog on good playing technique, was a guest performer. Sonia Beker holds a violin that her father Max, a Holocaust survivor, played. She donated the violin to Violins of Hope. "My dad's violin is on the table," said Sonia Beker, author of the 2006 book, "Symphony on Fire: A Story of Music and Spiritual Resistance." Beker was in attendance at the school event Wednesday afternoon. She said both her father, a violinist, and her mother, a pianist, were Jewish survivors of the Holocaust who played in an orchestra made up of survivors. Her father was a Polish soldier from Vilnius who was captured and held in a prisoner of war camp by the Germans. He was able to get a violin in the camp and played in an orchestra. "He had his violin with him all this time," Beker said. "I remember it from when I was a child. He and mother would play with their survivor friends. As the years went on, he played it less and less, and then he passed away. I had the violin. I don't play. Nor does anyone in the family. I just kept it. I learned about Amnon Weinstein and I thought, that would be a good place for my father's violin." "It's the continuity of the violin, and also the violin's story," Beker said. "I have been incredibly privileged and humbled by all these amazing events. I can't tell you how stirring it's been. It brings together these terrific history, family connections and the power of music, a remarkable force in the world." After the war, Sonia's parents and her aunt played in the same orchestra as Janet's parents! So many connections have been made and re-made through the work of Violins of Hope. While exhibitions are an important part of the project, performances have much more meaning to Amnon. He says, and Andy would agree, that violins are not furniture and that they must make music. Through music, their stories can be told in a new way. David Russel, a music professor at the University of North Carolina said that by playing one of Violins of Hope "I'm walking in their footsteps and their voice is actually heard by my playing". As Amnon continues his work, more of these performances and more of these violins will be able to tell their stories both as a testament to the victims of the Holocaust and as a way to educate people of the future. 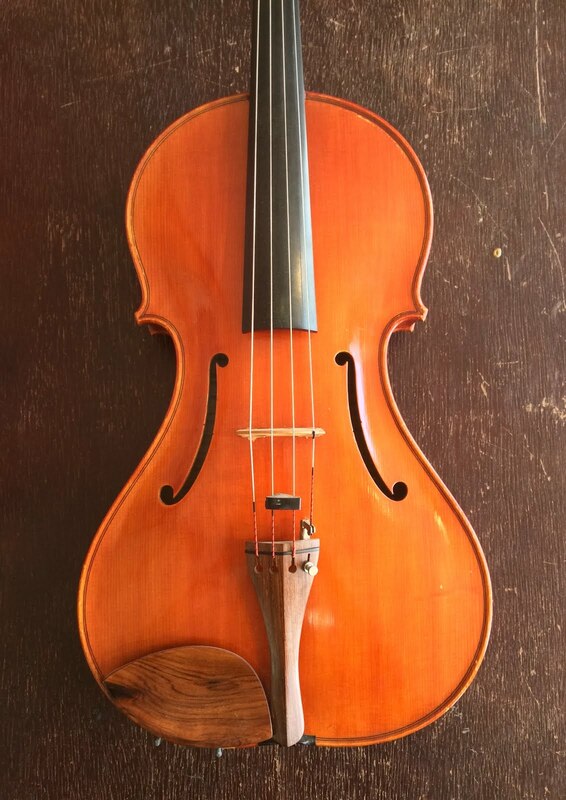 To learn more about Amnon's violins, you can check out the PBS documentary, the several articles written on the project, as well as the book "Violins of Hope" by James A. Grymes. 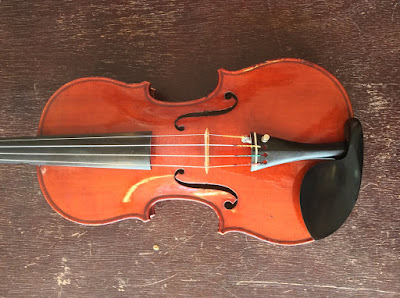 Below are some instruments, not in the collection of 'Violins of Hope' but that have passed through our shop with connections to Amnon and the modern history of the violin in Israel. A violin played by the Haim Taub, concertmaster of the Israel Philharmonic. Made in 1937, Tel Aviv by Haim Rappoport.